تلقى نادي ​تشيلسي​ خسارة قاسية وتاريخية امام ​مانشستر سيتي​ حين سقط بنتيجة 6 - 0 لحساب الجولة 26 من ​البريمرليغ​ الانكليزية. اللقاء تسيده رجال المدرب بيب ​غوارديولا​ بالطول وبالعرض ولم يسمحوا لرفاق ساري و​هازارد​ بالعودة الى اجواء المنافسة . فبعد مرور 18 دقيقة فقط كانت النتيجة تشير الى تقدم ​السيتي​ 4 - 0 على ​البلوز​ مما افقد اللقاء حماسه . الملفت في اللقاء كان امرين : الاول تسجيل الارجنتيني سيرجيو ​اغويرو​ هاتريك جديد له في البطولة والثاني كان عدم مصافحة المدرب الايطالي للبلوز ​ماوريسيو ساري​ للمدرب الاسباني غوارديولا حيث شوهد مدرب ​نابولي​ السابق يخرج من الملعب مباشرة بعد اطلاق صافرة نهاية اللقاء وبقي مساعده ​جيانفرانكو زولا​ لمصافحة بيب وسط ذهول الاخير. There is plenty up for grabs as Chelsea visit Manchester City to help conclude Sundays Premier League drama. Pep Guardiolas side will look once again to go above Liverpool in the league with a win against Chelsea, following the Reds triumph over Bournemouth on Saturday. However, Maurzio Sarris side will also be desperate for a win to move back into the top four following Manchester Uniteds victory against Fulham. TOTTENHAM 3-1 LEICESTER - MATT BARLOW AT WEMBLEY: Heung-min Son burst clear to score Tottenham’s third in the final seconds and create the illusion this might have been another routine home win. It was, in fact, anything but. Davinson Sanchez headed Spurs into the lead in the first half but Leicester missed a glut of wonderful chances, including a penalty which proved the key moment in the game. 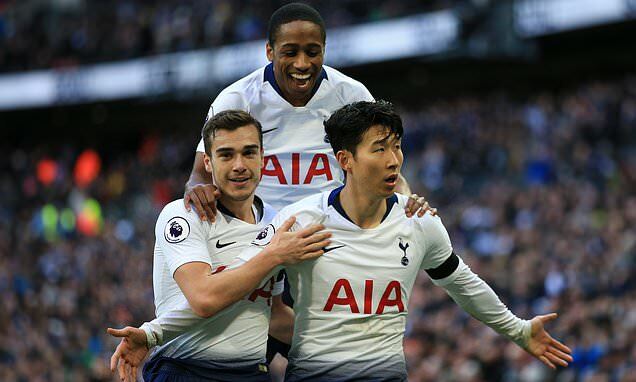 The taking of the spot-kick was delayed in order to allow Jamie Vardy on to take it but Hugo Lloris saved and three minutes later, Christian Eriksen extended the lead. 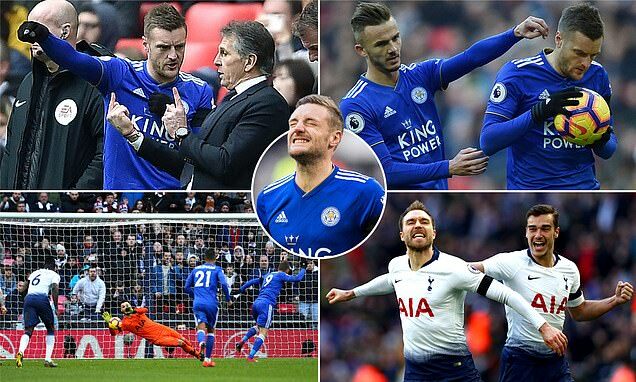 Vardy then pulled one back and Leicester were pushing for an equaliser when Son was released to sprint clear and fire past Kaspser Schmeichel. Fans fume as Vardy misses penalty with his first touch after coming on as a sub... minutes before Eriksen went up the other end to score!